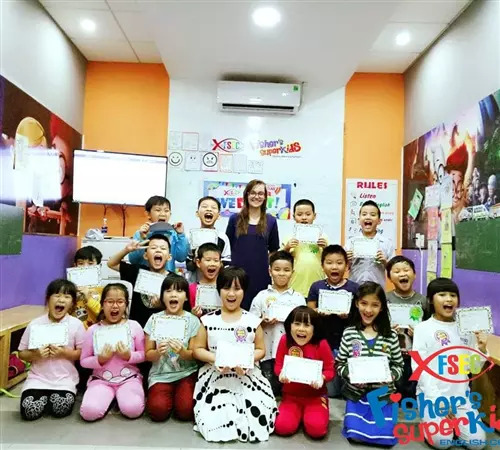 My name is Samantha Duckworth and I am an English Educator at Fisher’s Super Kids in Da Nang, Vietnam. I am writing to tell you of my experience working with this center. I am a teacher by heart and training, with a Bachelor’s Degree in Education. As a committed teacher, FSEC has been an incredibly fulfilling place of work for me. I have access to many materials and resources. If I have any ideas for lessons, they are carried out. I also feel full support in carrying out my teaching and ideas at FSEC. I am able to voice my ideas and feel supported with any opinions I share. The staff at FSEC are special: they truly care about each other and FSEC. There are little things that they do for one another that have a huge impact on the overall experience of being part of FSEC. How people treat one another at all levels of the center, filters through and creates a really positive environment. FSEC is a professionally-run center, with fantastic organisation. As a result of this, operations run smoothly. From what I have noticed, the students who come to Fisher’s LOVE to learn English. It is the best part of their day. It’s not unusual to see students excitedly running into class before it even starts - as if they literally cannot wait to begin. I think my favorite thing about Fisher’s is their approach to learning: that learning should be an active process, whereby students are participants and creators in their own learning.